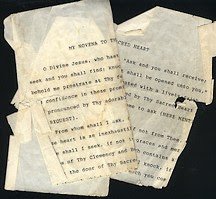 My mother typed this prayer for me several years ago on an old manual typewriter. It was a prayer that she and I said together often in the days when I still lived at home. As you can see, it has been well-used. I say it every day for my parents' health which right now can certainly use a lot of prayer. After realizing that this particular copy was beyond repair, I finally broke down and typed myself a new copy. From whom shall I ask, O sweet Jesus, if not from Thee whose heart is an inexhaustible source of all graces and merits. Where shall I seek, if not in the treasure which contains all the riches of Thy Clemency and Bounty. Where shall I knock, if it be not at the door of Thy Sacred Heart, through which you come to us and through which we go to you. Amen. God's sense of humor never ceases to amaze me. Just as I was "lamenting" the days when my children were challenging toddlers, God decided to send me one of the most challenging days I have had this summer. Isaac woke up this morning with horns. He and David were at each other's throats within 5 minutes of getting up. Seriously, my patience was gone by about 10 am this morning, and there was still a lot of the day left to go which didn't end until after David finally went to sleep an hour after I put him to bed and of course, tonight he was scared and didn't want me to leave. So I guess this was God's way of letting me know I am still very much needed and to not complain on days when the boys are being independent and well-behaved! Hopefully, tomorrow will be a better day. It has been said that our goal as mothers is to make ourselves obsolete. I've come to the realization in the past few days that I am starting to be phased out. Both of my children will be in school this year. I know for many parents, their children are away from long periods of time from when they are babies, but I have spent the past six years caring for these two little people, and now they don't need me in the same way anymore. They are ready to make their way in the world. Oh, I realize that it isn't like they are leaving for college, but still, it hurts a little. I was at our local park this morning with the boys. There was a mom there with two little boys of her own - one was age 2 and her baby was 7 weeks old. David and Isaac latched on to her and started regaling her with stories. Thankfully, she was kind and patient with them - the poor sleep-deprived woman probably hadn't had that much conversation in days! Still, as I looked at her own small children, I couldn't believe that it has been so long since mine were that size. Each day as you go through it seems long enough. There have certainly been days in the past few years that I prayed for bedtime. And yet, looking back, it has all gone by in the blink of an eye. All those days of changing and feeding babies, and terrible twos, and sleepless nights, and temper tantrums, and time-outs that I thought would never end are gone. Now I have two coherent, intelligent (at least most of the time) school-age boys who I like to be around most of the time. Oh, they still have their moments, and I know they still have a lot of growing up to do, and me, a lot of parenting to do. Actually, according to my mother, that job never actually ends! But, it is different now - a different stage, a different role. And it takes some getting used to. I won my copy of "The 4-Hour Workweek" from a contest on the Tech Rest blog. Author Timothy Ferriss has pretty much outsourced or automated all aspects of his life leaving him the money and freedom to spend his time traveling around the world doing pretty much anything he wants. He wrote this book to show other people how to do the same. Ferriss is young (about 30 years old) and single which to some extent colors his view of the world. While he maintains that having children should not impede your desire to travel around the world (and admittedly some people do this), for the majority of people the responsibility of having a spouse and children does keep them in more traditional work environments and tied to a community. Honestly, I am not looking to travel around the world. Although, for those who do want to do this, it is apparently not as cost-prohibitive as one might think and Ferriss offers much worthwhile advice on the topic. Why did I read this book? I am always looking for ways to make better use of my time and to make more money. I'm not impoverished by any means but if I had more money, I would use it to help pay off my husband's $130,000 student loan debt (we have been paying on this for 6 years now and owe $17,000 more than where we started because we have never been able to pay the full payment amount. The government is very kind setting up payment plans which we are very appreciative of, but even at our current $700/month payment we are simply treading water paying interest but no principal) and help to pay for my children to go to high school. Yes, high school, not college. Sending the two of them to our local Catholic High School will cost us $80,000. Numbers like that can keep you awake at night. I would also like to be more generous with charitable causes. The reality is that Ferliss' advice is good for those who work in an office in a non-service industry. Someone working as a teacher, social worker, therapist, etc. would not be able to physically remove themselves from their work environment, disconnect from other people, and still get their work done. There are some industries, though, where this is definitely possible and could be pursued. Thankfully, more and more companies are coming to the realization that letting people work where and when they want to actually leads them to being more productive. Another point Ferliss makes is definitely true - jobs fill the time they have been given. If you have to do something in a short amount of time, you somehow find a way to get it done. If you have a long period of time you stretch out the process and the end result is not necessarily any better! Therefore give yourself reasonable short-term deadlines and force yourself to focus on the task at hand. When you are working 9-5 in a traditional office the reality is that you often use "time-fillers" just to spend the time. That is not a good use of your time or your company's dollars. Ferliss encourages people to make changes in their lives rather than face a future of years and years slaving away at a job that they hate. He tries to get people out of their comfort zone and rethink how they might be living their life. While this book wasn't particularly helpful for me, I did enjoy reading it and I think that others might be able to benefit from it much more than I did. I'm going to donate my copy of the book to my local library where hopefully more people will be able to get some encouragement from reading it. Today is the feast of St. Monica and tomorrow is the feast day of her son St. Augustine. St. Monica is perhaps best known for perseverance in prayer. She prayed for years and years for the conversion of her son Augustine who was leading a sinful life. He eventually did convert and became one of the greatest Saints the Church has known. What greater testament is there to the power of a mother's prayers. One of our challenges in studying God and speaking about God is that all of our efforts automatically fall short. We can spend a lifetime trying to understand and know all there is to know about God only to decide like Thomas of Aquinas that all we have found out is like “straw.” We emphasize some characteristics and minimize others. Still others we can not even hope to comprehend. Still, the effort is worth it. To love someone is to want to know more about them. Think of a man and a woman in a new found romance. They spend every minute they can in each other’s company trying to discover everything about their beloved, yet even a lifetime spent together will not accomplish that task. If getting to fully know another human being is beyond our capabilities, how much more so is getting to fully know God. We do get glimpses, however. All of scripture gives us images of God. Jesus came to show us the Father and bring us into a personal relationship with Him. He invited us to call God “Abba,” a very intimate title similar to “Daddy.” Obviously, we have a God that loves us and cares for our well-being. This gives us great reason to rejoice. And yet, as that tremendous love has been emphasized in recent history, many have lost sight of one of the aspects of that love – God as disciplinarian. We don’t like to think of God as punishing us. The image of God as an judge held court for so long that the pendulum swung fully the other way so that we now have an image of God that excludes that aspect of His personality. We correctly think of God as merciful and ever ready to forgive, but just as a Daddy readily forgives his children, he also doles out some corrective measures at times. God doesn’t do this punitively, as punishment for its own sake, but rather to help us, his children, grow in grace and stay on the right road. Suffering is hard to accept under any circumstances and there are obviously times when bad things happen for no apparent reason. God can always bring some good out of every bad situation. Sometimes, however, God does allow us to suffer the unfortunate consequences of bad decisions we have made in an effort to encourage us to make a “course correction.” God is our loving Father and He always has our best eternal interests at heart. To fail to acknowledge that God’s discipline is part of His love is to try to fit God into the image of Him that we would like to have instead of seeking to discover God for who He is. Eric Scheske wrote a great article for the National Catholic Register called "Blessed are the Enlightened Ignorant." He reflected on how no matter how much we read or study, we will always remain relatively ignorant. The old adage is true: the more you know, the more you realize that you don't know. Scheske talks about how this relates to the internet. There is so much information and no where near enough time. So, is it all lost? Should we just give up and shut down the information overload? No, but we do need to make some decisions about what we spend time reading. I don't recall what age I was when I realized that I didn't have to finish something just because I started reading it. After twenty years of formal education, the process of trudging through dull books (admittedly not all of them were dull) all the way until their last paragraph was pretty much ingrained in my consciousness. It was liberating to realize I didn't have to do that anymore. I skim the newspaper and pick and choose what articles I want to read. I have favorite websites I visit every day but if the topic doesn't interest me, I move on to the next site. Most books I still do make my way through to the end. If it interested me enough to pick up, I give the author the benefit of the doubt and try to get some kernels of wisdom from the pages. I am much tougher on leisure reading. If a novel doesn't get me hooked in the first few chapters, I'm not going to waste my time. "Enjoy the books, enjoy the bloggers. If the authors and bloggers are doing their jobs right, they're increasing the sum total of joy in the world. Who knows? They might take away a little bit of our ignorance, too." I would never put Isaac in the same category as these children being profiled nor would I consider him a genius, but he definitely has advanced academic ability. He's not like other 4 year olds and as such I worry about him. (There is always something to worry about with children :) )He starts preschool in two weeks. He is looking forward to it and I hope he will have fun, but I'm concerned about the time they will spend teaching ABC's and 1,2,3s because he is at a first to second grade level in his math and reading. Also, he will play with other children and he has a good imagination, but like most gifted children, he prefers the company of adults. He is going to try to talk to the teachers all day and they simply won't be able to give him the conversation he will crave. I have proposed starting a gifted program at the Catholic school that David and Isaac attend. The principal is still mulling it over. It will be interesting to see how it all plays out. One of the great things about summer is that there has been plenty of time for the boys and I to curl up and read some great books. My boys really enjoy mysteries. They started with the Cam Jansen series by David Adler last year and made their way through most of those. These summer they discovered "The Boxcar Children" by Gertrude Chandler Warner. Ms. Warner began writing this series in the 1940s about 4 orphaned children, Henry, Violet, Jessie, and Benny, who hide out in a Boxcar to avoid having to go live with their Grandfather whom they have never met and who they are very afraid of. These children are incredibly resourceful. The first book didn't even feature a mystery, but it soon became the mainstay of the series as children clamored for more and more stories about these children. Ms. Warner passed away in 1979 but the series was revived in 1991 by the Albert Whitman publishing house and there are now 111 titles available. These are chapter books, about 120 pp in length which take about 1 1/2 hours to read aloud (I know this because my children insist on reading them in one sitting - it's OK - it's a good way to spend an afternoon!). The truth is, I have been enjoying the stories also. Today we read my favorite one so far, "The Mystery at the Crooked House" which features a story about a mystery writer and a unique house. If you haven't already discovered the Boxcar Children, I encourage you to check them out. As I have written before, I am slowly but surely trying to convert my family into green living by making small changes - buying organic and/or local products whenever possible, recycling everything that can be recycled as well as buying recycled products when available, and using energy-star appliances and energy-saving lightbulbs. My small step that I started today is unplugging my desktop computer when I shut it down. It's not a huge thing - a minor inconvenience - but it will save a little bit of energy and all those little bits add up. Our diocese has a live televised mass each Sunday at 10 am. This week our pastor was saying the mass and it was intended to be a "Children's Mass" like he says every weekend at the Sunday 9:45 am service where we are regulars. Therefore, he extended an invitation to (indeed, begged) members of the congregation to come to the downtown chapel for mass where the television program is filmed. Now, there is a reason that we go to the children's mass and that is because our children are not always on their best behavior. They have gotten much better over the years, but they still have their moments. The prospect of attending a mass where they would be televised filled me with fear. I hemmed and hawed about it all week. Their less-than-stellar behavior at the mass we went to on Wednesday for the Holy Day did nothing to allay my concerns. As of last night, I had decided I would just take David. He's older and by himself is not likely to raise a ruckus. Isaac and Bernie could go to a different mass. I knew that decision would mean less stress for me, yet I didn't feel great about it. The passage from the gospels where Jesus said "Let the Little Children Come to Me" kept ringing in my ears. Jesus wants the little children around him and that means at mass as well. What kind of message was I sending by telling Isaac he couldn't go to this mass? This morning, when Isaac got up, he said he wanted to go. He promised to be extra good. I still had my doubts. After all, it can be difficult to trust a 4 1/2 year old. But, we went - all of us. We sat in the very last row of the very small chapel, which somehow looks much larger on television. Many of our friends were there as well. Perhaps it was the change of scenery or the large monitor showing what was being televised and the clock counting down the time that kept their attention, or maybe it was the threat of losing their allowance if they didn't behave, or perhaps it was divine intervention, but somehow, they were quiet. I held my breath and prayed as they went up to the altar for the homily and again for the Eucharistic Prayer. "Please, please let them be good," I begged God. And somehow, miraculously, they were. I was so unbelievably thankful. I gave them big hugs after mass and told them how proud I was of them. If only they good be that good every week! 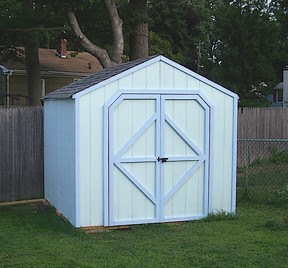 Regular readers might recall that Bernie and I built a shed to celebrate our 10th wedding anniversary. It took a few weeks to get the finishing touches done - finish the roof, paint, put the latch on, but I am happy to report that it is done! You invite all who are burdened to come to you. and help me to lead others to You by my example. Touch gently this life which You have created, now and forever. Amen. If you truly live your faith than no matter what your line of work, that faith will shine through. Your faith can't help but shape your worldview. I have a special interest in the integration of faith and art. There are many wonderful Catholic and Christian artists out there spreading the good news through their art, whether that art is visual, literary, or musical. One group of Catholic visual artists I just read about in the National Catholic Register. Franciscan Renaissance is a group dedicated to promoting the culture of life in their work. While the website is definitely a work in progress, it does give a glimpse into the type of work these artists are creating. My favorite piece is "Heart of Mary" by Wendy McNeill, a third-order Franciscan. This painting is an icon for an upcoming pro-life tour (Future Depends on Love) which will be used as a prayer card and for the tour's banner. Some of the proceeds from the sale of the art pieces featured go to help the Franciscan Friar's of Renewal's hands-on work with the poor. Where was God in your day today? One means of seeing God's movement in your life is to make a regular practice of taking the time before bed to look over your day. God is there in the details of our everyday existence. What were the highs and lows, the positives and negatives? What left you feeling confused? What things do you need to tell God you are sorry for? What should you say "Thank you" for? Bring your concerns to God. Ask for clarity and the wisdom to make good decisions. Pray for those you came in contact with. Pray for situations that concern you. Rest easy knowing that you have turned the fruit of your day over to God. An Assumption Day Announcement: Celebrating the Feminine Genius — an Anniversary! Remember. O most gracious virgin Mary, that never was it known that any one who fled to your protection, implored your help, or sought your intercession, was left unaided. Inspired with this confidence, I fly unto you, O virgin of virgins, my mother. To you I come, before you I stand, sinful and sorrowful. O Mother of the Word Incarnate, despise not my petitions, but, in your mercy, hear and answer me. Amen. I was so excited when my first child learned to say “Thank you!” David was about a year and a half then. In fact, I can recall sharing that news with one of the nurses when I was in labor for Isaac. “My son just learned to say ‘Thank you!’” Who knew that five years later I would still be prompting him and his brother to utter those words on many occasions? At the times when either one of them does remember to say some words of thanks when they receive something, I still feel happy! Especially if those words are being said to me! “Thanks, Mom” is something you can never hear too often. I don’t know that children are hard-wired to be grateful. They come into the world with a set of needs and (hopefully) those needs are met. They cry and we feed them or change them or hold them, whatever the case might be. We make sure that they are washed and clothed and have some toys to play with, all without one word of thanks. They stop crying or they smile and that is all the appreciation you need at that stage of the journey. If parents are doing their job, children expect that their needs will be met. This builds trust and is the way it should be. Then these same children start talking and most parents make an effort to teach their children to be polite, to say their “pleases” and “thank yous.” Learning and using the words is one thing. Actually cultivating a spirit of gratitude is another. I can’t claim to have been an exceedingly grateful child. Oh, I was polite enough, although I am sure that my parents must have done their share of “prompting” as well. I also knew that there were those in this world that had much less than I did. My family and I contributed to food drives and toy drives. As far as those I could actually see in my school and community, however, it seemed that most people had much more. I would look longingly at the clothes and toys and wish that I could have the same. When I would complain, my parents would rightfully tell me to be thankful for food and a warm house and all the things that I did have. I have used that same line on my own children. I am trying to instill in my children a spirit of gratitude, to help them understand that much of what they receive in life are gifts freely given which they should not only express thanksgiving for, but actually feel it. I try to help them understand that all good things ultimately come from God and that we need to thank God on a regular basis. Every night I ask them to say “thank you” to God for something that happened that day. I try to instill in them a generous spirit as well, to help them know that there are many who are not as fortunate as we are and that we are obligated to help them. As a family, we donate to our parish food bank on a weekly basis and to the Church and other charitable organizations. They are required to put a small portion of their allowance in a separate piggy bank for charity. This will hopefully establish a habit of giving. Part of gratitude is being satisfied with what you have. I know that is an uphill battle. Especially for children, the world is full of new items just begging to be owned. Every toy and game looks so exciting. If I am being honest, I will admit that it is still a struggle for me. While I may not pine over the latest action figure, there are certainly items I would like to have. I sometimes still need to be reminded to be grateful for what I have, although I am the one generally doing the reminding. I know that teaching my children to be grateful is a lifelong process. Hopefully, the lessons I try to teach to them will take root and bear fruit. Hopefully, they will learn from my example, flawed though it may be at times. I also realize that true appreciation for what they have might not come until they are adults and on their own and forced to pay all the bills. I know that I have gained a considerably greater thankfulness for what my parents provided me in the days since I got married and had children of my own. Life is a wonderful teacher! In the meantime, I will continue to be thankful for all the “thank yous” that come unprompted from my children and take them as a sign that gratefulness is indeed becoming part of their being. Isaac picked up "Everyday Math for Dummies" at the library. He saw the word "Math" and had to have it. Once he saw that it contained more words than numbers, however, he put it down. As I flipped through it I decided I would bring it home anyway, if only for the chapter on balancing your checkbook, a task I have always struggled to master. This is actually a very good book, providing an introduction to the Math that you wish that they would teach you in school - like how to balance a checkbook, figure out compound interest (OK - I think they taught that one in school but it had little real-world applicability at that point), and how to understand stock values and mortgage rates. And for those of you who really want to understand what they wanted to teach you in Algebra and Trig, it provides sections on that as well (I'll admit I skipped over those). I read the reviews on Amazon and some mentioned that it wasn't simple enough. I can understand that. You do need some understanding of basic math to get this book - adding, subtraction, multiplication, division, and percentages are all taken for granted here. Still, it was very interesting and helped explain some topics that had eluded me for years. My friend sent me this as an email forward today. It is a prayer attributed to St. Therese and based on her "little way." Whether or not she authored it, it is in keeping with her philosophy of life and prayer and reaching for God. soul the freedom to sing, dance, praise and love.
" 'Perfection is not for this world.' This adage is not meant to lock us into mediocrity. Even though we live in this world, we are not of this world. We have been made for God's world, but how do we reach it? We must walk on and push forward, day after day, on the road to perfection, which is love." Several of my friends have second homes a few a hours away that they retreat to on summer weekends. They love that lifestyle and it works for their families. As for me, I can't even imagine having the energy to pack up and travel three or four hours for two days away. What I do love is going to our local pond which has a small beach complete with lifeguards. It is this beautiful oasis in the heart of a city. It is so peaceful and beautiful there and it is only 5 minutes away! The family and I will often spend an hour or two there after my husband is done with work. We can swim and the boys play in the sand and it just washes the stress of everyday life away. A mini-vacation can be a wonderful thing. Where are the hidden retreats near where you live where you can just get away from it all for a little while? A vacation doesn't need to be long or far away to be refreshing. in union with Saint Joseph. During the academic year, my family goes to the library on Saturdays which means that Mom and Dad take turns watching the children in the children's section while the other adult gets to look at and choose "grown-up" books. In the summer, however, our local library is closed on Saturday which means that I venture to the library on my own with the boys. This also means that if I want to choose some books and magazines to read, the boys need to come upstairs with me. While I choose some magazines that I want to look at, the boys pick out magazines that look good to them. So, this morning, I found myself reading to them out of "Car and Driver" and another magazine on trucks whose name I don't recall. While certainly not my usual fare, I have to admit that I did learn some interesting things about old milk delivery trucks! In the name of the Father and of the Son and of the Holy Spirit. How many times do we say those words and make the sign of the cross on our bodies? We do it so frequently that we often do it without thought. While our current form of making the cross by touching our forehead, our chest and our two shoulders has been in existence since the middle ages, Christians have been using some form of the sign since the earliest days of the Church. The original form was a cross traced on the forehead using the thumb. Tertullian (160-220) tells us that “in all our travels and movements, in all our coming in and going out, in putting off our shoes, at the bath, at the table, in lighting our candles, in lying down, in sitting down, whatever employment occupies us, we mark our foreheads with the sign of the cross.” We still use this form prior to the Gospel in the liturgy. Two recent books, The Sign of the Cross: The Gesture, the Mystery, the History, by Andreas Andreopoulos (Paraclete Press, 2006) and The Sign of the Cross: Recovering the Power of the Ancient Prayer, by Bert Ghezzi (Loyola Press, 2006) trace the history of the Sign of the Cross as well as the theological meanings that have been attached to it. For example, there has been some disagreement as to whether to complete the cross by touching the right shoulder or the left shoulder first. The right cross, still practiced by Eastern Orthodox believers, symbolizes how "Christ descended from the heavens to the earth, and from the Jews (right) He passed to the Gentiles (left)." In Roman Catholic practice, the left cross has become traditional indicating the hope that at the last judgment, the believer will be on Jesus’ right rather than his left. Regardless of the form, the sign of the cross is a sign both of Christ’s ultimate gift of salvation gained through the cross as well as of our belief in a triune God. It is an outward sign of our faith and that we love God with all of our mind, our heart, and our strength. It is a prayer that uses our bodies as well as our words, a fitting reminder that our bodies are temples of the Holy Spirit. The Sign of the Cross represents the heart of what we believe. It is both a prayer and an attitude. If we truly profess to live our lives “In the name of the Father and of the Son and the Holy Spirit,” it will manifest itself in how we live. When we want to improve or work on some area of our life, it is often helpful to have a mentor. This need not be a formal arrangement, although it could be. I have read in career books about asking someone to be your mentor and setting up official meeting times. In my life, however, I have generally found the arrangement to be much more fluid. My mentors have been and continue to be people that I admire for their skill in some area. Some have been friends, some work associates, still others teachers. I have parenting mentors that I look up to, friends who are just a few years ahead of me in this adventure of parenting. In my work, I have other writers whose careers and style of writing I admire. In my spiritual life, I have a formal arrangement with my spiritual director to help me along the journey, but there are also those among my friends and family whose devotion to God I admire on a personal level. The important thing is to choose to emulate some aspect of your mentor's life which is lacking in your own. Observe them, talk to them, see how it is that they do what they do. Most people love to talk about themselves and are happy to offer their hard-earned pearls of wisdom. See if you can incorporate some of their habits into your own life. Admittedly, you are a different person and bring a different set of skills to the table, but often you can find one or two behaviors you can adapt to fit your life which may help you achieve the desired result.